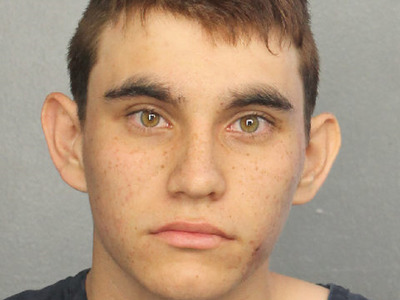 sheriff.orgA police mugshot of Nikolas Cruz. Nikolas Cruz, 19, has been charged with a mass shooting in at a Florida High School. 17 people are dead after a gunman opened fired at Marjory Stoneman Douglas High in the town of Parkland on Wednesday afternoon. Sheriffs posted a custody record online showing 17 separate murder charges. Cruz faces the death penalty if convicted. Nikolas Cruz, the suspect in the mass shooting at a Florida high school on Wednesday, has been charged with 17 counts of premeditated murder. Sheriffs in Broward County, Florida, posted a custody record online the morning after they arrested Cruz, who is 19 years old. He is the only suspect in the mass shooting at Marjory Stoneman Douglas High School in Parkland, Florida, in which 17 people have so far been confirmed dead. Cruz’s jail record lists him as being 5ft 7ins tall and weighing 131 lbs. Officials also published a mugshot photograph of him. It listed 17 separate counts of premeditated murder, matching the latest casualty figures from officials. The record indicated that there was no possibility of bail. Under Florida law, Cruz faces the death penalty if convicted. Cruz was arrested around a mile from the school, an event which was caught on camera by passers-by and news helicopters. “All kids joked around like that, saying that he was going to be the one to shoot up the school. It turns out everyone predicted it. That’s crazy. Click here for Business Insider’s full timeline of how the shooting unfolded.